Glovius v3.0 for iOS is now available! We are pleased to announce the availability of Glovius version 3.0 for iOS. This update brings a lot of new features including Freehand Markup, Retina Support, Show/Hide Components by Material/Color, Email models, Sample models and performance & user interface improvements. 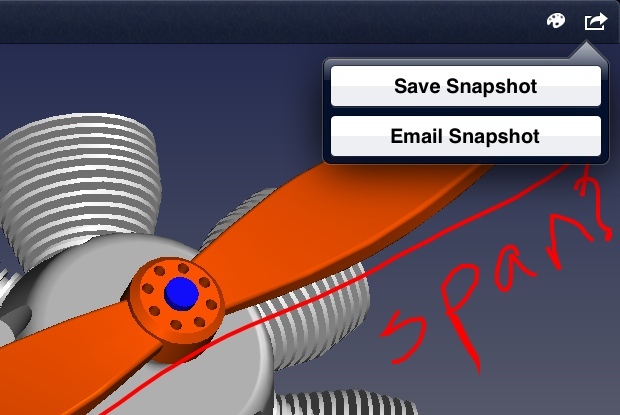 Freehand Markup : Markup on model snapshots and save/email snapshots from within the app. Pick a color for your markup. Show/Hide Components : Show/Hide components based on their material/texture/color properties. Email Models : Email models from within the app. Recipients can view the emailed model using free Glovius Lite apps on their iOS & Android devices. Sample Models :A few sample models are now included in the app to get you going quickly. User Interface Improvements : The app now supports retina resolutions. Options and Settings dialog have been merged and moved towards the top right corner to provide more room for the model.